Gladstone Printing is a full service commercial printer able to handle any size printing project. Gladstone is located 3 miles West of downtown Lansing. The employees at Gladstone are true craftsman and take ownership of each clients’ project. We specialize in short run four color printing and digital printing. Our mission to exceed client expectations by providing highest quality product in a timely manner. We create long-lasting relationships with our clients so we can help them meet their goals and objectives. Gladstone Printing is independently owned by Travis Millbrook. The company was purchased in 2002 from the Gladstone Family, which had owned and operated the company in Lansing for over 20 years. Entering the new century, Gladstone has embraced new digital technology. We understand that investment in technology can save client costs by improving efficiencies. We are leading the way among Lansing area Quick Printers by taking advantage of the most current digital printing technology in our industry. 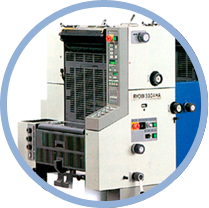 Our commercial printing equipment is state of the art and ensures that we provide our customers with superior quality products. We are dedicated to keeping up with the changes in the printing industry to make sure your printing project is produced economically and at the highest quality possible.